Tis the season for SILLY MAMAS!!!!! look at that funny face! Hi there, You look so adorable and I bet you'd bring the best presents a pup could ever want. Oh Lily your eyes speak volumes.......! You look stunning in that hat Lily! But a little less Hum Bug & a little more Ho, Ho, Ho please! BOL! I don't think you are feeling it??? If dogs could talk, I think you'd hear a mouthful from Lily. Hi hi hi! Ojo here! Lily, you look very Christmasy! How are you feeling?? Oh my, Lily! Please smile, it will be over soon enough. But you do look cute in your Santa Paws hat! 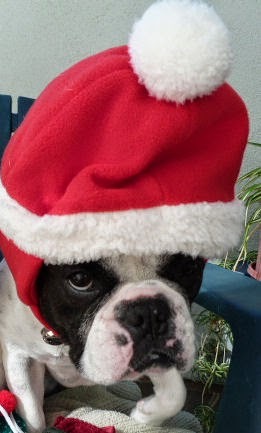 We feel your pain, Lily - and that hat is bigger than you!!! Santa paws? Is that you? Just remember...if you play along now, there are big rewards later! You look great in your hat! Da momma ain't got da hat out here. Yet. BOL, you look thrilled Lily! BOL tis the season to go and hide Lily. Have a tremendous Thursday. Very cute Lily. I bet Edward looks just as striking in a red velvet cap.